If you’re like us, you can hardly scroll through social media without seeing someone post about the keto diet. Celebrities like Halle Berry and Kourtney Kardashian credit the trendy lifestyle for their weight loss, healthy skin and high energy levels. But what is it? In short, the keto diet consists of a high-fat, low-carb lifestyle where the body goes into a ketogenic state and burns fat instead of carbs for energy. It’s most popular for its help with weight loss, but it also offers various health benefits to people with epilepsy, diabetes, irritable bowel syndrome and acne. Celebrities aren’t the only ones raving about the diet. Mestizo Restaurant owner Jim Urdiales says since launching his keto-friendly menu in July, he has at least one keto-friendly order placed a day. Whether you’re already on the keto diet or considering it, we found several places in Baton Rouge to try keto-friendly dishes that also happen to be delicious. Mestizo Restaurant: After looking through the dishes on Mestizo’s keto-friendly menu, you almost forget there are no carbs. 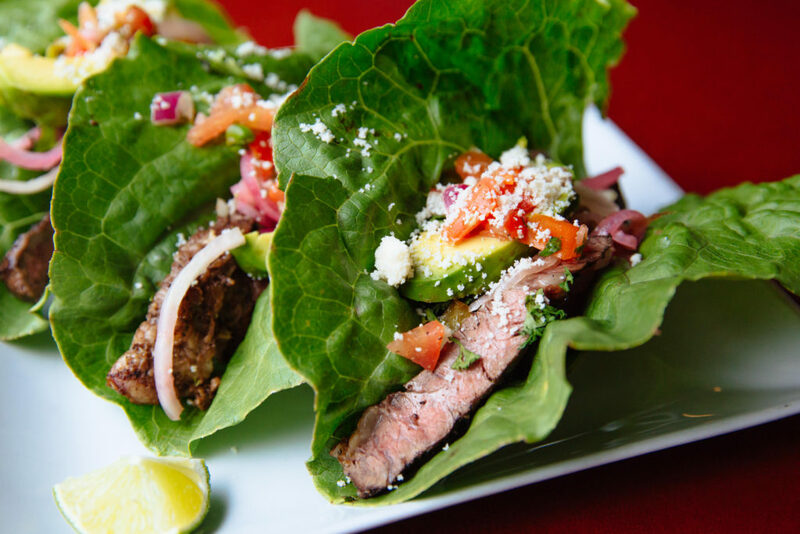 From frisco tacos with grilled skirt steak served on lettuce wraps to a hearty cauliflower bowl with grilled chicken, there’s a keto-dish for everyone to try. Did we mention it serves low-carb cocktails? Southfin Southern Poke: Most people following the keto diet can agree that one of the main issues with the lifestyle is going out to eat and having to list off all the ingredients you can’t eat. At Southfin, you won’t have to worry. Customers can build their own poke bowl from scratch. Instead of choosing their popular purple rice, replace the carbs with mixed greens or zucchini noodles. Before topping your bowl off with one of their delicious sauces, go over the ingredients with your server. Remember: sugar and sweetened sauces are a no-no. Zoës Kitchen: In need of a quick keto-friendly snack or lunch? For a snack, you can pick from Zoës Kitchen’s shrimp, chicken or steak kabobs. For lunch, try the cauliflower rice bowl with chilled cauliflower rice, tzatziki (yogurt sauce), Israeli skhug (hot sauce), feta cheese, cucumbers and fresh dill. Lit Pizza: The beauty of the keto diet is that it is cheese friendly. While you may not be able to indulge in a stuffed crust pizza, you can dive head first into Lit Pizza’s homemade cauliflower crust made of freshly grated cauliflower, cage-free eggs, Parmesan and mozzarella cheese. Just be sure to watch social media—the crust often sells out. The Velvet Cactus: Who doesn’t love bottomless chips and creamy queso? Although tortilla chips are off-limits, The Velvet Cactus offers a delicious keto-friendly alternative: cauliflower nachos. The low-carb appetizer include tomatoes, bell peppers, jalapenos, cilantro, cheese and avocados piled atop a plate of roasted cauliflower. City Pork: Make your own keto-friendly picnic with a City Pork charcuterie board. Skip the bread and crackers and fill up on your choice of meats and cheeses. Cheeses include cheddar, gouda, blue, brie and gruyere. For meat, customers can pick from assorted house-smoked, dry-cured and spread options. Texas de Brazil: At Texas de Brazil, there’s no shortage in protein. Whether you want a stack of juicy braised beef ribs or chicken breast wrapped in bacon, the meat options are endless. To get a well-rounded, low-carb and high-fat meal, make your own salad using the various cheese, meat and vegetable options at the salad bar. Ruffino’s: Ruffino’s doesn’t just make good pizzas and steaks. Its salad and seafood options boast bold flavors, spices and plenty of cheese. Next time you need to get your vegetable fix, try the Sensation salad with gorgonzola vinaigrette, romaine lettuce, pistachios, prosciutto and roasted tomatoes. Dat’z Italian: Going out for pizza with your friends? No worries. As of August, Dat’z Italian offers a limited amount of cauliflower crust pizzas. Pick from toppings like cheese, pepperoni, bell peppers, spinach and beef to complete your keto-friendly pizza. Know of another place in Baton Rouge to get delicious keto-friendly dishes? Let us know in the comments!